When you&apos;re on vacation you don&apos;t want to have to wait until the evening hours for a great beverage. 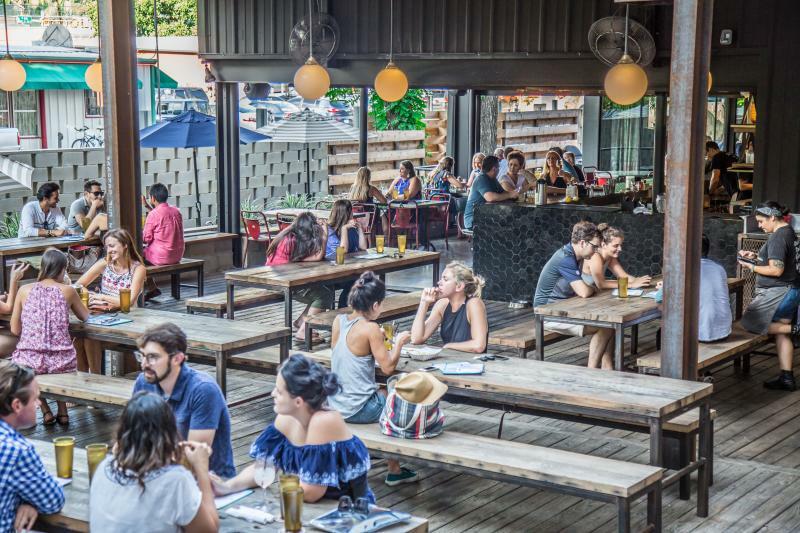 Explore the map below to check out our list of some of the best happy hour spots in Austin that start early in the day - sorted by the area of town and what time each happy hour starts. We&apos;ve called out some of our downtown favorites below! Start your crawl with one of Swift’s Attic’s Ice Ball cocktails and some charred edamame, which is served with chile oil and pop rocks! Happy Hour: Mon-Fri 2-6:30 p.m.
Say oui to this Parisian restaurant - whether you choose to sit inside near the oyster bar or soak up sun on the patio. Happy Hour: Mon-Fri 3-6 p.m.
Irene&apos;s Patio. Credit Lost In Austin. Go for the adult juice boxes at this patio bar and eatery in the West Sixth Entertainment District. Happy Hour Mon-Sat 3:30-6:30 p.m. While you’re here, be sure to curb a future hangover with some delicious bites from the happy hour menu. And order the biscuits on the regular menu - trust us! Located in Hotel Van Zandt, a stylish, music themed hotel, Geraldine&apos;s regularly offers music programming. Music touches are found everywhere - even being piped out from the in-pool speakers on the pool deck! Happy Hour: Mon-Fri 5-6:30 p.m.
Ashley is the Marketing & Music Manager at Visit Austin and spends her time giving Willie a run for his title as the red headed stranger. When she’s not putting together recap sizzlers or sharing the latest meme, you can find Ashley rowing or kayaking, checking out the newest restaurant or front row at a show around town.